Western Digital, known for producing high-level storage solutions, has announced its next generation of NVMe SSD drives. The WD Black SN750 NVMe SSD will be a high-performance drive with a capacity of up to 2TB on a single-sided M.2 form factor. The new NVMe SSD drives will be optimized for serious PC gamers, as the drives will feature an integrated heatsink that will allow for speed and temperature maintenance. These second-generation NVMe SSD will be built using Western Digitals 3D NAND technology, firmware, and controller. To maximize the drive’s performance during gameplay, the SN750 will feature a vertically integrated SSD platform. This will allow PC enthusiasts to easily upgrade their gaming rigs. The SN750 will deliver read speeds up to 3,470 MB/s1 for the 500GB and 1TB model and write speeds of 3,000 MB/s1 for the 1TB model. With this new read and write speeds, users will be able to access their programs, files, load games, as well as transfer large games, 4K or 8K video, and other content that is typically data-intensive in a more seamless and faster way. The Black SN750 is built in collaboration with EKWB, one of the leaders in PC cooling technology. To manage the fast read and write speeds, typical NVMe SSDs are engineered to throttle performance to keep temperatures at acceptable levels. But with the EKWB-designed heatsink (on capacities from 500gb to 2TB), it will dissipate heat from the drives during extreme and intense operations. This will allow the SN750 to sustain optimal read and write performance for longer periods of time. The drive will also feature IOPs of 515,000 random-read and 560,000 random-write for extreme throughput. This, in turn, will give the SSDs the ability to manage multi-threaded applications and data-intensive usage. This will also allow for a higher response rate when trying to access numerous files in multiple locations for loading new levels or games and a reduced time to process in-game saves during gameplay. Western Digital has also included a gaming mode feature to the WD Black-exclusive SSD dashboard. This will give players the flexibility to turn-off the low power mode and keep the SSD running at optimal levels for consistently high performance. The new WD Black SN750 is available now without the EKWB included heatsink. The SN750 with included heatsink will be released globally in Spring 2019 and will be available at select Western Digital retailers, e-tailers, resellers, system integrators, and distributors. Capacities range from 250GB up to 2TB, with the 2TB model also releasing in Spring 2019. Prices will range from $79.99 to $499.99 MSRP, dependent on model and capacity. 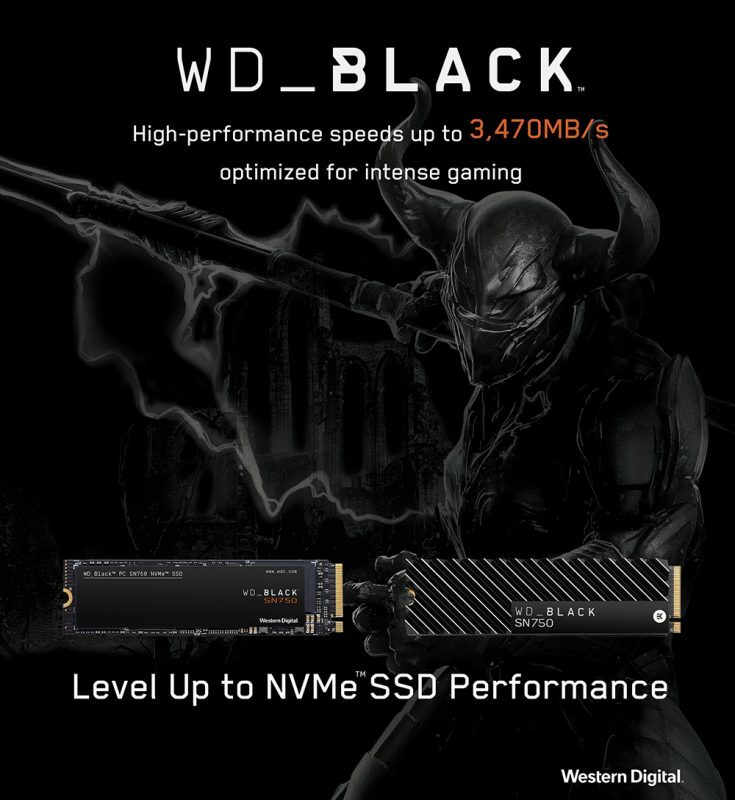 The post Western Digital targets gamers with new NVMe SSDs appeared first on Nerd Reactor.